With my summer work term at a close I can look back at a successful summer with ThermalWise. We were able to get the tasks done for the website we had set for ourself at the start of the summer, which feels great. AtlanticGreenBuilding.ca is really starting to take off! We added a map to the website which shows products manufactured in Atlantic Canada. You can enter your postal code it it will zoom in on products close to you. This helps builders and owners find products that are from the area, and not shipped in. By buying locally you reduce transportation related emissions as well as help the local economy. Have a look at the map here. Eight different videos were produced by us this summer, as well as 10 new or improved project profiles. The videos showcase green building projects in the area and include interviews with people involved whenever possible. These videos turned out very professional, and make the profiles much more interesting to viewers. The ThermalWise team has expressed an interest in hiring us to produce additional case studies in the future, which means they are obviously impressed with our work. You can view the project profile and videos here. I’ve learned lots about green building products and services through this job. I was fascinated with all the innovative ideas that were put on the market in recent years. Researching these products has taught me a lot about green washing and how to detect it. By developing and sticking to strick criteria for listing products we were able to identify which ones were actually green and which ones were just faking it. By developing case studies I’ve learned about and witnessed different building strategies. One of the most interesting was the combination of Passive House standards with LEED certification that was used by Passive House E-Design and Leonard Construction when building the Hawkins House. The Hawkins House is the first passive house in Nova Scotia and possibly the greenest home in the province. It uses Passive House which focuses on extreme energy efficiency, and combines it with LEED which contains the broader green strategies related to materials, energy and water use, sustainable landscaping, and design innovation. There is a workshop on Passive House and LEED combination at the Greenbuild Expo this fall and I will be attending for sure! This job has identified a career path for me that I didn’t always consider. I’m really interested in Project Management. A lot of the work we did at ThermalWise was very dynamic. It was always different and required different skills and different planning. Project management is the business of working on different projects for a fixed time period with unique challenges and outcomes. When I look for my next job I’m going to try to find one that will put me to work in project management. This time of work ensures every day is different, challenging, and exciting. This week is the end of my work term with ThermalWise through the Nova Scotia Youth Conservation Corps. 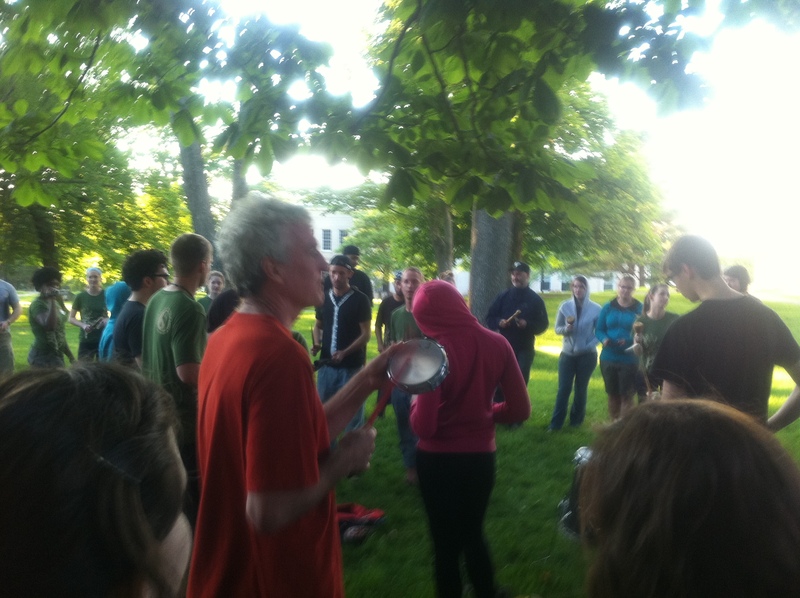 The Corps held a debrief exposition at Mount Saint Vincent University to wind the program down. Each crew was responsible for putting a booth in the exposition to showcase our summer projects. Members of the community were invited to attend including the Minister of the Environment the Honorable Sterling Belliveau. – What would you change? – What were some of the challenges you faced? Another event was a roundtable discussion with people working in the field of environmental science. They discussed what led them to where they were today and told us about what kind of work they did in their jobs each day. It was very interesting. This was followed up with a workshop on interview skills including some mock interviews. It is great to be told by someone who does a lot of interviewing what they are looking to hear! I very much enjoyed my summer working with the youth corps and I think that it is a great program. I’ve learned a lot in my position and I’m sure I will take that knowledge with me as I move on from here. My two month work term with ThermalWise through the Nova Scotia Youth Conservation Corps is now half over. Things have been going spectacular so far. The office is a very dynamic place to work and there is always something new and different to do. The website Atlantic Green Building is coming along great and we have completely reviewed all the green products and services listed to make sure the information is current. We are working on adding a map of product origin so that builders can locate regionally manufactured materials. Buying regional materials cuts down on transportation related energy emissions. The LEED rating system also awards points for using a certain amount of regional materials. The project profile section has been completely redone. We have been using a new format that includes background information, green features, and post occupancy performance. We updated all of the old profiles to the new format and added some new ones. The new project profiles we created so far are The Halifax Seaport Farmers Market, The Mersey Tobeatic Research Institute, and Dalhousie’s Mona Campbell Building. Aside from the webpage I have also been able to take part in two different stages of the LEED for Homes process. 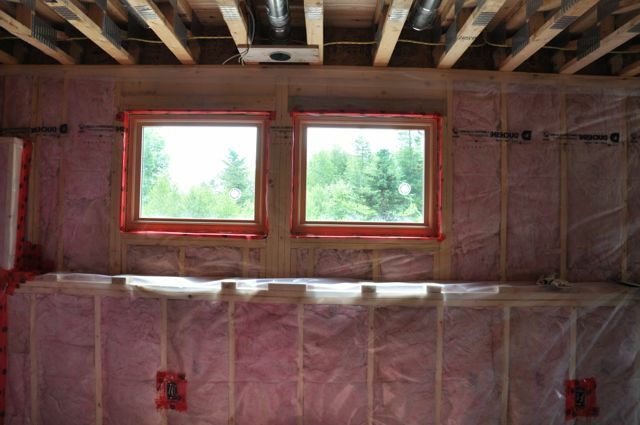 ThermalWise is the LEED for Homes provider for Atlantic Canada and I was able to participate in a preliminary evaluation as well as a pre-drywall inspection. One of the LEED projects we are working on is also seeking the German Passive House standard. I was able to assist with the blower door test at this location. The weeks remaining are going to be just as exciting and I will provide another update at the end of the term. The pre drywall inspection is the first required site inspection in the LEED for Homes process. A green rater will need to visit the site to inspect the wall cavity. This step is crucial because once the drywall goes up it is impossible to inspect and verify many of the requirements for certification. This step must be completed and any home looking to pursue LEED certification must enroll before the drywall goes up to allow for this inspection. I recently helped with a pre drywall inspection on a building targeting LEED Platinum. The inspection involves checking to make sure that the insulation is properly installed in the wall cavity. If it is batting insulation it must not be compressed or it won’t prevent air from moving and will perform poorly. Other insulation types should evenly fill the cavity. 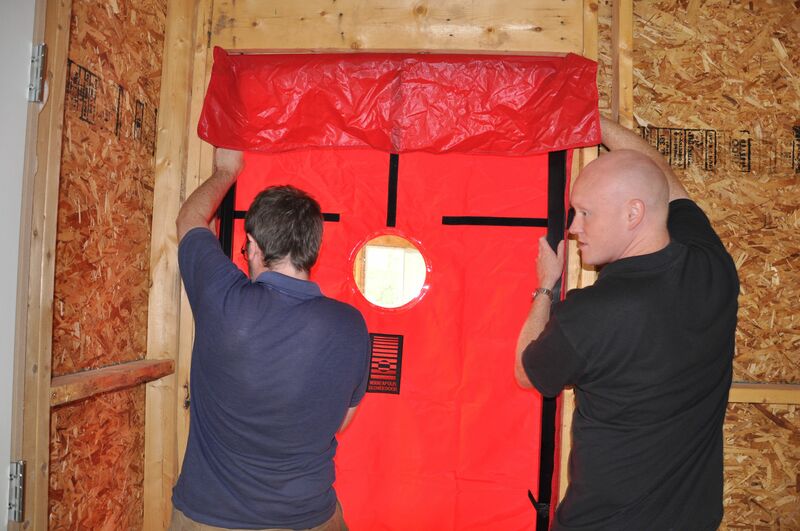 It is also important to check that the vapour barrier is in place and properly sealed. 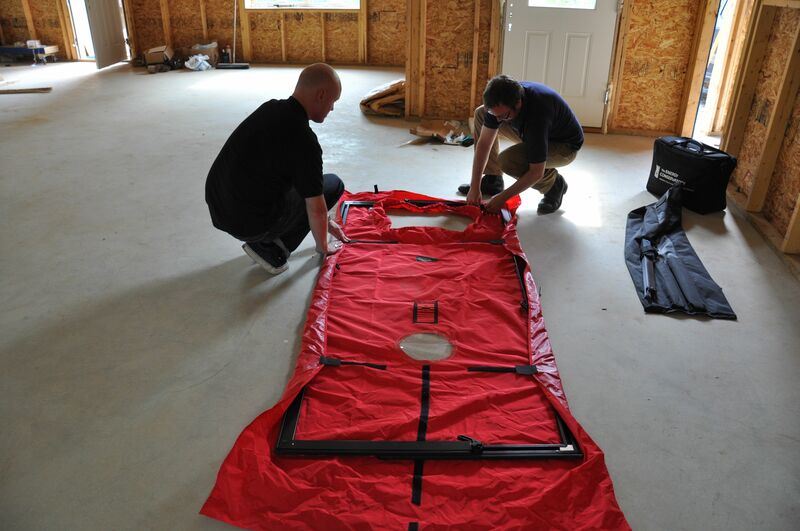 Any insulation problems that are identified during the inspection can be fixed before the drywall is applied. It is also required that all ductwork be sealed to prevent contamination with construction debris. Ducts contaminated with dust and other debris will need to be cleaned, which is very difficult, or they will have adverse effects on the indoor air quality. Duct sealing is required by LEED and the pre drywall inspection will make sure that this step is completed. Any LEED checklist items that are located behind the walls must also be verified at this time. For example, if the home was hoping to earn points for having pipes insulated this would have to be verified now, while the pipes are still visible. The wall cavities need to be inspected before the drywall covers them up for good. I have recently been getting some experience using a blower door. This is a device that is used to measure the amount of air infiltration in a building. The amount of air changes per hour that occur because of air passing through cracks in the buildings envelope has a big impact on the energy used for heating and cooling. Air leaks generally occur at the seams around windows, doors, and other holes. An R2000 home should have less than 1.5 ACH (air changes per hour) while a passive house sets its standard at 0.6 ACH. The blower door connects to an exterior door frame of the building and covers the entire opening. It uses a large fan to create a pressure difference of 50 pascals between the interior and the exterior. Once the pressure difference is in place you can check for leaks in the building envelope by using smoke. If you see smoke being drawn through the envelope you mark the area and come back and seal it better after the test. 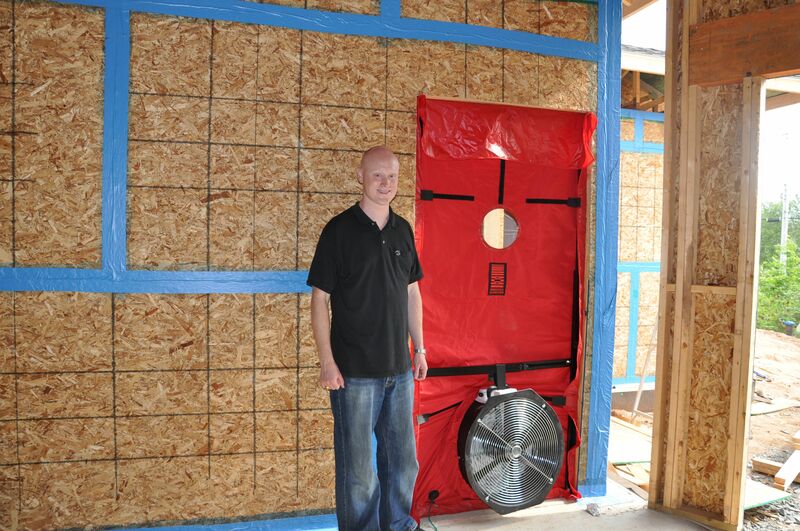 I recently took part in a blower door test for a passive house. Since 0.6 ACH is so low and hard to achieve the builder had a preliminary blower door test done early in the construction process to identify problem areas while they could still be fixed. Often blower door tests are done at the end of the construction when it is too late to fix problems, and I was impressed with the extra steps being taken to ensure efficiency. The blower door I used is called the Minneapolis Blower Door and is manufactured by the Energy Conservatory. I recently took part in a LEED for Homes preliminary evaluation. This is the first step in the LEED for Homes process and involves going through all of the requirements for LEED Certification before construction of the home starts. Starting the process early is key because it allows all parties involved to set clear goals and performance requirements. This is important because many LEED credits don’t add cost but they must be initiated early in the design process. LEED uses an Integrative Design Process which means all parties involved (owner, builder, architect, landscaper etc) collaborate throughout the process instead of working independently. The last two are LEED for Homes specific. Location and Linkages works to ensure that the home is located in a developed area within walking distance of amenities and public transportation. This helps prevent urban sprawl. Awareness and Education helps promote LEED for Homes by encouraging you to hold an open house for the community, as well as install LEED signage to highlight your recognition. The project team goes through the LEED for Homes checklist and identifies what it is capable of achieving. The prerequisites are the most important part because the project cannot be certified without meeting these. In additional to specific prerequisites LEED for Homes also has minimum point thresholds in each of the categories. The team confirms it can meet the prerequisites and identifies which credits it can achieve and which ones it might be able to achieve. The spreadsheet tallies up the total credit points as well as the credit points that may be possible. Depending on how many points the team thinks they can obtain the project sets the target for Certified (Lowest), Silver Certified, Gold Certified, or Platinum Certified (Highest). LEED for Homes contains a home size adjuster and is the only LEED program to contain such an adjustment. It is designed to reward those who build a smaller home instead of a larger one. The spreadsheet will use the size of the home and the number of bedrooms to calculate this adjustment and determine the point thresholds for each level of certification (Silver, Gold etc). Homes of the same size will do better if they have more bedrooms. Finally an accountability form is filled out which identifies which member of the project team is responsible for which prerequisites or credits. This form will guide the team through the LEED for Homes process. Did I mention that LEED for Homes is the only 3rd party verified rating system in the country for homes? For more information on the LEED for Homes rating system visit the Canadian Green Building Council. 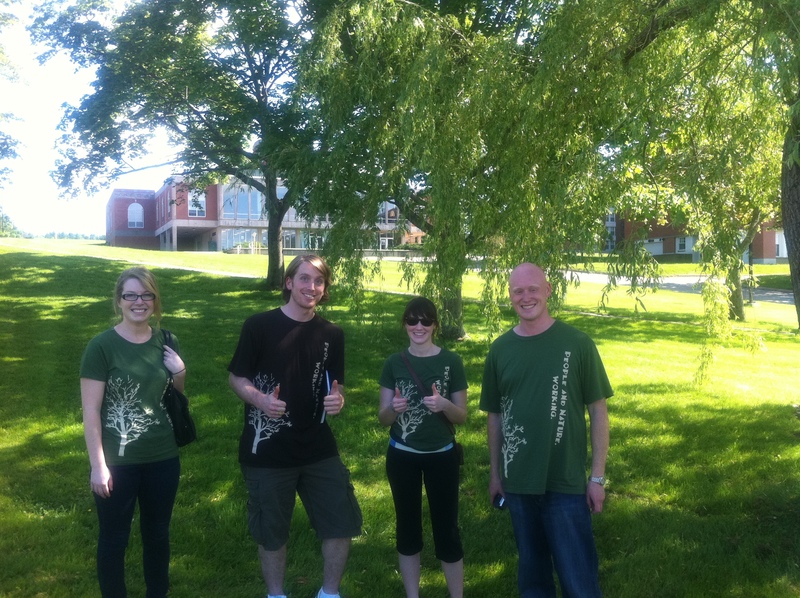 I spent the last three days doing orientation and training for the Nova Scotia Youth Conservation Corps. I will be working with the NSYCC on assignment with ThermalWise for the next two months doing green building research. Training camp took place at Acadia University in Wolfville. I was impressed with how many other people they employ. There are at least 50 others working on various environmental projects throughout the province. I found some crews who have work that relates to mine and we will be collaborating over the summer. I travelled up with Laura Hayes, who is my crew partner on the ThermalWise project, as well as Adam Hayter and Megan Borden who are working together with the Union of Nova Scotia Municipalities. Training included a full day of first aid as well as an introduction to WHMIS and occupational health and safety. We also did several team building exercises and got to know one another. Lil MacPherson from the Wooden Monkey Restaurant in Halifax gave a spectacular presentation on global warming and the impacts it will have on our food supply. She taked extensively about sustainable food and why it is so important. This is of particular interest to me because it represents one of the credits in the LEED Operations and Maintenance certification. The weekend wasn’t all work and no play. We managed to find time for a trip to the local swimming hole on White Rock Road and had some group musical jam sessions as well. At the end of the summer we will get back together and present on our projects to each other. I’m really excited to see how everyone makes out. Megan, Adam, Laura, and myself on the first day of training camp. Group jam session led by Mr. Mustard. Part of my new job over the next two months will be to maintain and improve the website www.atlanticgreenbuilding.ca . I will be working as part of a three person team with another student in Halifax and one in Newfoundland. 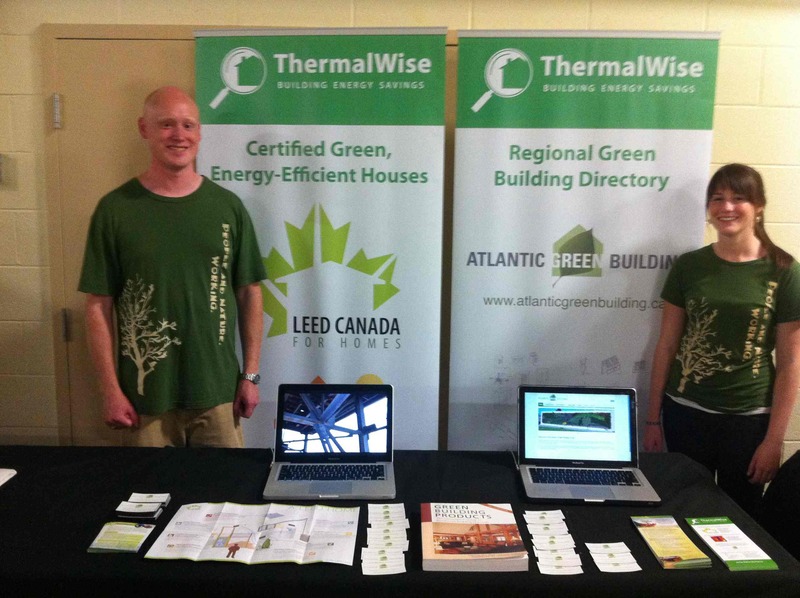 Atlanticgreenbuilding.ca provides information on green building products and services available in Atlantic Canada. This can be very useful to building owners and builders who are working to obtain LEED certification. Having all the information together for them in one place and verified by a third party makes planning easier. It also helps eliminate green washing, which is when a company pretends to be environmentally conscious but really isn’t. The website features a virtual tour of green buildings in the area, as well as project profiles on them. The list is short at the moment but we will soon be adding case studies on some of the new and amazing green buildings that have been opened in the past year. This year we will have lots to choose from and that is evidence that green buildings are becoming the standard way of building. There have been several LEED for homes projects in the area over the past year. Information on rebates is available to consumers on the website for Nova Scotia, New Brunswick, PEI, and Newfoundland. This section will be changing quite a bit for Nova Scotia because of the recent launch of programs by Efficiency Nova Scotia. I know this project will be a learning experience for me and I am excited to begin. Researching the different products and services on the market will make me more aware of what options there are out there. By doing case studies of existing LEED buildings I will witness the different approaches that can be taken to achieve the different levels of LEED certification. I am planning to someday write my LEED AP exam and I think that this work will contribute to my studying for that as well. New job with ThermalWise and The NSYCC! Today I accepted a new position with a company called Thermalwise that is funded through the Nova Scotia Youth Conservation Corps (NSYCC). The NSYCC provides employment and training to youth aged 17-30 in Nova Scotia in the field of environmental sustainability. They teamed up with ThermalWise to create two job positions doing green building research. ThermalWise is dedicated to helping reduce the impact of Atlantic Canadians on the environment by promoting and facilitating green building initiatives. They provide green building assessment, certification, consulting and education services to homeowners, building owners, developers and the general public. • Highlighting entries in the database of green building products that are made in Nova Scotia. • Maintaining the databases of green building products available in Canada, as well as community groups, businesses and government departments that provide green building related services. • Creating a series of case studies highlighting innovative green building practices in both new and retrofit applications. Case studies will showcase not only the techniques but also the people involved. This will include interviewing these people. • Creating a series of videos about green building projects in Nova Scotia. • Developing a mechanism for the public to submit examples of the steps they’re taking in their own homes to improve energy efficiency. • Organize and upload information to the website and update website through the summer. • Maintain a blog on the project site that highlights the crews work and progress. I am really excited for this position and I start on Monday June 27th.